A note I found today, in the men’s bathroom, at CCC. Yep. They’ll know we are Christians by our love…unless they disagree with us on any number of political issues. Then, they’re on their own. This is not about supporting one candidate/political party over another, but about how Christianity looks when it comes to politics. 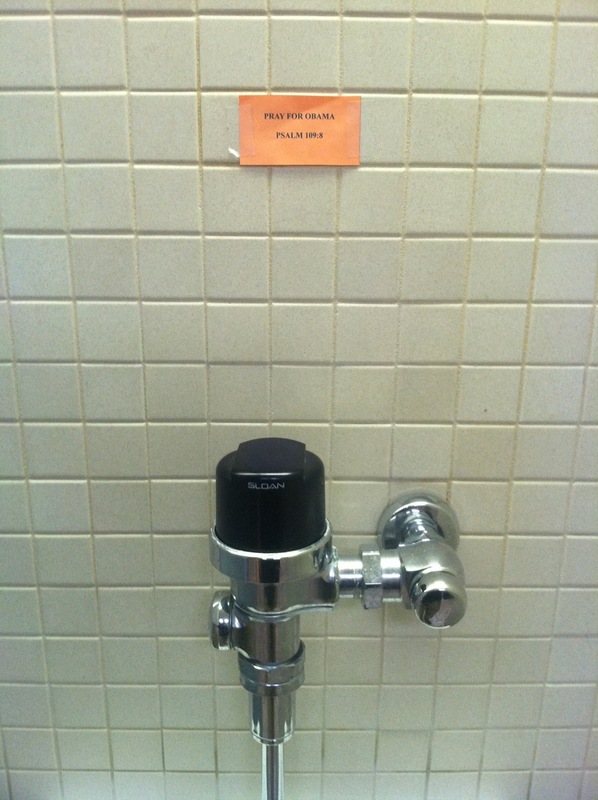 *Perhaps not as creepy as the pastor (me) taking a cell phone picture of a urinal. We have a church policy that there will be nothing posted by people unless it gets approval. When I first started attending, it was not uncommon to see all sorts of randomness being posted on the bathroom doors, over the urinals, and the backside of the stall doors. Usually it was some random event that someone was trying to promote. Sometimes, it was religious or political in nature. Whatever the note/flyer was, it usually was a design mess. It looked bad. We never had any idea what was being promoted on those sheets. Two of the reasons why we enacted the policy of taking things down that have been posted without consent. 8 May his days be few; may another take his office! *And being unoriginal. People were sending this verse to others about two seconds after Obama won the 2008 Presidential election. About the same time people were starting up a Facebook Group to support his impeachment…before he even took office. Like I said, it’s not about supporting one candidate or political party over another. In my opinion, this kind of stuff gets in the way of what’s important. In recent years, I’ve talked with a number of people who don’t consider Christianity, or take it seriously, because of Evangelical Christian’s close ties to the Republican Party. I’d rather lose political battles than lose someone’s soul. I think it is good to be educated on the issues. I think it is one’s civic duty to vote. I think it’s good to be informed. I don’t think it’s good when Christians focus more on politics than Jesus. Sure, a lot of Christians say they don’t, but their time and money say otherwise. They’ll spend hours a day consuming political talk radio and watching cable news where the hosts have a contempt for differing opinions. Some of the political commentators, for all their postulating, do not reflect Jesus at all, and yet they are shaping many minds in the church. While I’m focusing in on Christians who let their Republican beliefs be the primary influence with their faith, this occurs on both sides of the political aisle. I’ve met a number of Christians who let their Democrat beliefs be the primary influence with their faith. We need to be letting Jesus guide and influence us. Glenn Beck or Keith Olbermann should not have more say in our lives than Jesus. Back to the verse in Psalm 109. Here’s context of what it says around verse 8. 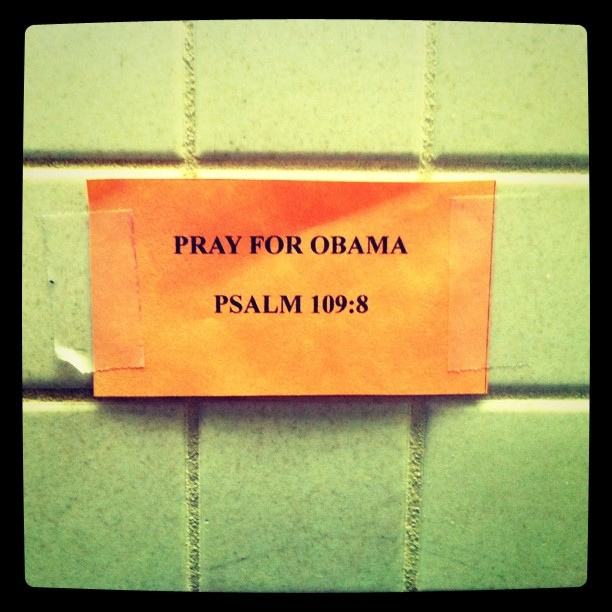 If people pray Psalm 109, with President Obama in mind, do they also want him to die? Do they want his family ruined? If one thing is partially true, it is Psalm 109:12a. Many in the church have refused to extend kindness to President Obama. I know this from the forwarded emails and Facebook requests/invites I’ve received, from people in the church, about President Obama that are derogatory. I know this from the tweets and Facebook status updates, from people in the church, that show contempt and hate for their President. It’s about Jesus. Christianity looks foolish, to people who aren’t Christians, when a number of its believers engage in this type of behavior. I get angry when we let secondary political issues get in the way of leading people to Jesus. I get frustrated when Christians, and the church, step back and look to government to fulfill the responsibilities that God has asked of Christians. I get frustrated when Christians spend more of their time and resources on politics than God. Government is not your God and/or savior. I think part of my frustration stems from being guilty of what I’m talking about. When I first started following Jesus, I thought being Christian was being Republican. Many of my leaders, at the time, espoused such thinking. So, I thought you had to toe the line when it came to Republican politics. Over the years, I’ve stopped the syncretic thinking of the two. I’ve tried to focus in on Jesus. *For a primer on this, I’d recommend the message “Arguing About Politics” by Tim Keller. You can download the message, for free, from iTunes. *In working with young families and young professionals, at Christ Community Church, I’m meeting a lot more registered Democrats. Bucks the stereotype some have of CCC being Republican. **They may be shocked to know there were CCC staff that voted for Obama in 2008. Some staff “confided” in me, partly because they knew I wasn’t going to take them to task for it. God is more powerful than any individual or government. Pray for President Barack Obama and his family. If it goes well for him and his family, from a Christian standpoint, doesn’t that benefit everyone? It’s all about Jesus. Make Jesus primary, and politics secondary. Why Big Omaha? 5 F’s As To Why. While the fact that young people at CCC are registered Democrats may buck the stereotype that CCC is Republican, it only adds to the stereotype that the young and (yes, I realize I'm young as I type this but this is still what the stereotype is of young voters) uneducated are registered Democrats (don't worry though, because only white, old, fat, bald, rich WASPs are Republicans…). There are plenty of Republican young professionals and families that are coming to CCC as well, but the fallacy is for CCC attenders to assume that everyone attending CCC is Republican. I've never equated being “uneducated” as part of that young and Democrat stereotype. As they get older, could they drift away from that? Perhaps. Of course, I know people who have drifted away from the Republican party as they have gotten older. The bigger point of the post, though, is not about political stereotypes and trends. It's about not letting politics get in the way of what God call us to. Thanks for reading bro. Hope you are doing well. The funny thing about this particular cherry is that by picking verse 8 and applying it to Obama they have accidentally equated him to the author, as verses 6-19 are undoubtedly the “words of hate” that the author's adversaries have encircled him with (verse 3). So now Obama is David and the Christians propagating the verse 8 prayer are those with wicked and deceitful mouths that he is requesting deliverance from! Agreed! As Christians, we lead by example. Acts of kindness speak louder of our Savior's love than a post-it in the bathroom with a political agenda (that will certainly offend.) It's not about the politics, it's about God.